Brexit was the biggest issue in the general election and will continue to be so in British politics for at least the next five years. Our 2017 manifesto was one of the most successful we have had for years. We gained three million votes and picked up seats all over the country. Our Brexit manifesto set us on the path to government. At no point did we articulate the notion that we would support a second referendum. At no point did Labour suggest we would be remaining in the single market or the customs union. Indeed, our leader who has been returned twice has said on many occasions that leaving the European Union will include leaving the single market, customs union and opposition to any second referendum. Labour policy on Brexit was clear. Since then a growing number of rebels have worked to challenge and undermine Labour policy on Brexit. Many of those who either resigned from the frontbench when Jeremy was elected or who supported a leadership challenge are now working to alter Labour policy on Brexit. A number of backbench MPs have called for a second referendum or ongoing membership of the single market and customs union. If we remain in the single market we will not be able to deliver upon our manifesto pledge to “end freedom of movement”. If we remain in the customs union will be reduced to the position of a “vassal state” as highlighted by shadow trade secretary Barry Gardiner. As a result of the efforts by certain backbench MPs, Labour policy on Brexit is now unclear among voters up and down the country. Many of those seeking to overturn the referendum explain that, because a majority of Labour members support EU membership, then the party ought to change its position. Members are important, but they are not as important as the voters, because it is the voters and not members who determine elections. 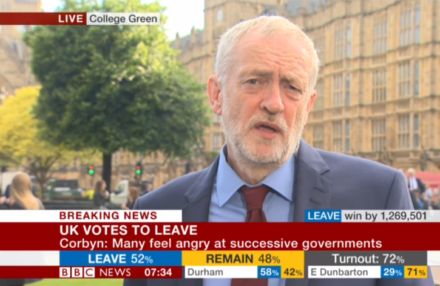 A majority of the British people voted to leave, including 70 per cent of Labour constituencies. This cannot be ignored and, by challenging Labour policy, Remain MPs who refuse to accept the outcome risk causing Jeremy Corbyn and the party serous electoral problems, especially in Labour seats that voted leave. Labour supported a referendum on EU membership. The taxpayer-funded leaflet, which the government sent to every household, was clear that the decision of the British people would be implemented. Indeed, on the morning after the referendum, Jeremy was the first major political leader to call for article 50 to be invoked so that we could get on with leaving the EU. At no point was a second referendum mentioned and at no point were the people told it would be an option. Most opinion polls show that an overwhelming majority of the British people do not support a second referendum. Even among Remain voters, and amongst young voters, a majority have accepted the outcome of the referendum and that Britain will leave the EU. Labour should be firmly in this territory. Of course, those who believe passionately in the EU should continue to make the case for their federal union. But, as democrats, they should accept that a decision to leave has been made. Individuals within the Labour movement such as Alastair Campbell, Tony Blair’s former communications director, and Lord Adonis, a former member of the SDP, should have the right to make the case. But they should be ignored. If Labour were to take the advice of these individuals it would be the biggest political error in modern political history. For the Labour Party to completely u-turn on a manifesto that won huge support would present our movement with existential challenges and cause a constitutional crisis unprecedented in our nation’s history. Labour must be responsible and while accommodating Remain voices it should not follow their lead. Brexit is a challenge to the Labour movement but it is also an enormous opportunity. Our attitude should turn from caution to optimism and we should be focusing on the positives. We need to develop a comprehensive set of policies for the first Labour government post-Brexit. Our offer to the country must be one that builds unity and gives hope, not one that opens the wounds of the past and creates uncertainty. Brendan Chilton is director of Labour Future and general secretary of Labour Leave.